Although the Leonard Bernstein/Comden & Green musical tribute to the Bohemians in Greenwich Village, Wonderful Town was seen in New York at Encores! 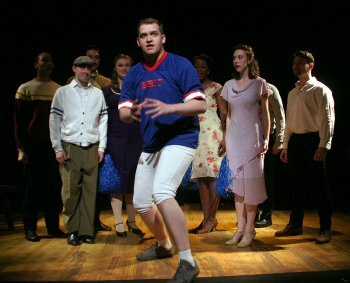 in 2000 and on Broadway from 2003 – 2005, Evan Pappas’ revival for Musicals Tonight! has given it a fresh, animated slant. Using a youthful cast of bright new faces, this Wonderful Town is inventive, sassy and sophisticated. Choreographer Antoinette DiPietropolo has a great deal of fun with the five dance numbers which she handles in varied lively styles. Based on Ruth McKenney’s autobiographical stories, My Sister Eileen, and the 1943 Broadway adaptation by librettists Joseph Fields and Jerome Chodorov, Wonderful Town tells the zany story of the Sherwood sisters Ruth (the smart one) and Eileen (the pretty one) who come to New York in 1940 from Ohio to make it big in the arts. Ruth wants to be a writer and has a suitcase full of unpublished short stories. Eileen wants to be on the stage and can sing as well as act. Arriving on a limited budget, they end up in a basement apartment on Christopher Street where the transit authority is dynamiting a new tunnel right under them, the previous tenant was Violet who had a lot of male visitors, and their landlord Mr. Appopolous fancies himself an avant-garde painter. Ruth’s stories are rejected by editor Robert Baker of The Manhatter who falls for her instead, while Eileen meets and is pursued by Walgreens’ manager Frank Lippencott and Chick Clark, a libidinous newspaper man. When Chick arranges a phony job for Ruth to cover the arrival of the Brazilian cadets in Brooklyn in order to be alone with Eileen, it results in Eileen getting arrested. All works out happily when she ends up on the front page of the newspaper and she and Ruth both get jobs at The Village Vortex, a night club popular with the hep cats. Along the way they are befriended by Wreck Loomis, an all-American college football hero in the off season, and his live-in girlfriend Helen, as well as Officer Lonigan and the boys at the police station. Played by musical director James Stenborg at the piano, the 1953 Bernstein score retains its effervescence and charm, as well as presaging music to come from him in future years. Comden & Green’s witty lyrics include the lovely ballads “A Little Bit in Love,” “A Quiet Girl,” and “It’s Love,” the close harmonizing “Ohio” and “My Darlin’ Eileen,” as well as the clever “One Hundred Easy Ways to Lose A Man,” “Conversation Piece,” “What A Waste,” and the fast-paced “Wrong Note Rag.” Pappas and DiPietropolo’s inventive staging makes the opening travelogue “Christopher Street” and the reenactment of “Ruth’s Stories” inspired vignettes. Bernstein’s catchy rhythms are deftly danced to in both the “Conga!” and “Swing” dance numbers. While Pappas’ production is a delightful throwback to a more innocent time in the Big Apple’s history, it is guilty of some odd choices. While Ruth explains that as the smart talking dame she loses all of the men she meets to her beautiful sister, this production has cast the gorgeous Elizabeth Broadhurst which doesn’t make a lot of sense. In fact, she is more glowing than the pretty Savannah Frazier who plays Eileen who we are told is irresistible to men. In addition, Broadhurst is saddled throughout the evening with a very short blue mini-skirt which is completely anachronistic for pre-war 1940. Nevertheless, Broadhurst is fine as the too witty dame who frightens the men away, while Frazier’s Eileen seems to be entirely able to take care of herself. James Donegan is a stalwart Robert Baker, almost too principled for publishing, though some of his songs seem to be out of his vocal range. Leland Burnett gives a showstealing performance as the lecherous Chick, while Ian Lowe is amusing as the nerdy Frank who arrives with a gift from a Walgreens sale whenever he visits Eileen. Among the colorful characters are Perry Lambert’s Greek Appopolous, Paul Binotto’s Italian Speedy Valenti, proprietor of the Village Vortex, and Joshua Downs’ disapproving Irish Officer Lonigan. David J. Wiens as the gentle giant Wreck and diminutive Jillian Gottlieb as his girlfriend Helen have a special rapport. Piera Calabro has a vibrant take on Violet, the good-time girl, while Leslie Alexander as Helen’s small-town mother, Mrs. Wade, alternates between frowning disfavor and giggly approval. Wonderful Town is one of those musical comedies which seem to get better as they age due in this case to the classic quality of the Bernstein/ Comden & Green score and the witty book by Fields and Chodorov. Director Evan Pappas has given the Musicals Tonight! revival a bright, breezy, high-spirited production that is certain to put a smile on your face, while for a change you can go out humming the songs. Much more should be seen of Elizabeth Broadhurst who sparkles as would-be writer Ruth Sherwood. Take the road less travelled this Christmas and prepare to laugh with this darkly humorous show. An amiable but flat rare revival of the classic 18th century comedy of manners by Oliver Goldsmith. Smart, stylish, fast-paced revival of The Gershwins’ rarely revived 1927 musical may just be Musicals Tonight!’s most polished show.